Examples, solutions, videos, worksheets, and activities to help PreCalculus students learn how to use DeMoivre's Theorem to raise a complex number to a power and how to use the Euler Formula can be used to convert a complex number from exponential form to rectangular form and back. The following diagram shows the De Moivre's Theorem for complex numbers. Scroll down the page for more examples and solutions. We know how to multiply complex numbers, but raising complex numbers to a high integer power would involve a lot of computation. Fortunately we have DeMoivre's Theorem, which gives us a more simple solution to raising complex numbers to a power.DeMoivre's Theorem can also be used to calculate the roots of complex numbers. 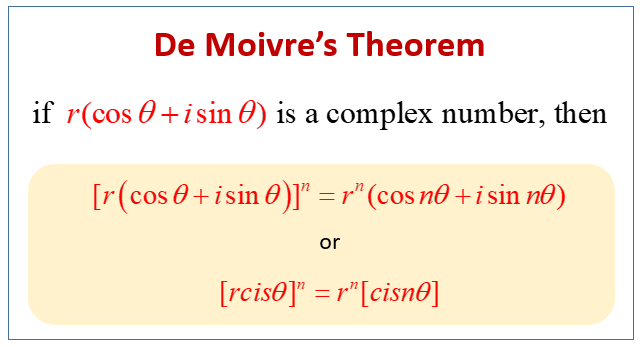 DeMoivre's Theorem uses the trigonometric form of complex numbers. How to raise a complex number to an integer power using DeMoivre's Theorem? How to use De Moivre's Theorem to raise complex numbers in trigonometric form to any power? DeMoivre's Theorem: Raising a Complex Number to a Power, Ex 1. This video gives DeMoivre's theorem and use it to raise a complex number to a power. Note that our number must be in polar form. DeMoivre's Theorem: Raising a Complex Number to a Power, Ex 2. In this video, we want to multiply powers of two complex numbers. We use Demoivre's Theorem to help simplify.. Note that our number must be in polar form. DeMoivre's Theorem: Raising a Complex Number to a Power, Ex 3. In this video, we want to raise a complex number to a power. we use Demoivre's Theorem to help simplify.. Note that our number must be in polar form. One formula that is used frequently to rewrite a complex number is the Euler's Formula. The Euler's Formula can be used to convert a complex number from exponential form to rectangular form and back. The Euler's Formula is closely tied to DeMoivre's Theorem, and can be used in many proofs and derivations such as the double angle identity in trigonometry.